Perfect Island Location! Heated pool and plenty of room for the entire family. 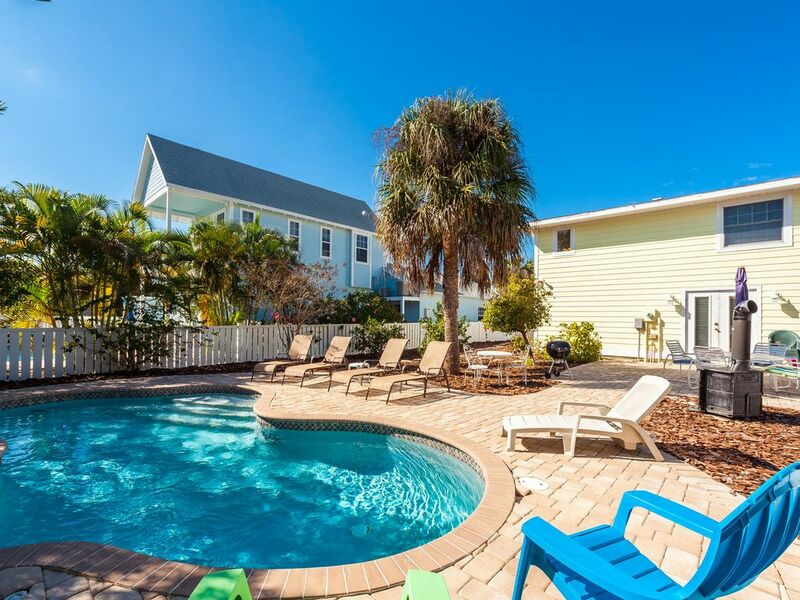 Anna’s Cottage is a completely renovated island home that is perfectly located on Spring Avenue in the city of Anna Maria. Only 2 blocks west is the beautiful Gulf of Mexico and the Sandbar restaurant. Only 3 blocks east is the historic Anna Maria Pier and the Waterfront restaurant. It is also an easy walk to several shops and additional restaurants including one block from the new Pine Ave. shopping district. Anna’s Cottage has over 1600 sq. ft. of air conditioned living space that includes two separate living areas. There is also a large screened porch, covered lanai patio and huge paved pool area for plenty of outdoor living space that’s needed in the Sunshine State. The second floor master suite has a king bed with flat screen t.v. and a large master bath with huge walk in shower and dual sinks. On the first floor, there is a second bedroom with queen bed and the third bedroom has 2 twin beds that is accessed by a sliding barn door. All 3 bedrooms have cable w/ flat screen t.v. The family room television is a 30' LCD High Definition T.V. and DVD. High speed WiFi is available throughout the property. The pool is constantly heated to a very comfortable 80 degrees and has plenty of sunlight for hours of sunbathing. There also is an outdoor shower to rinse off after a day at the beach. This house is our dream home located on the best island in Florida. My wife and I own it with my parents. We live in northern Alabama and my parents are in Greenville, SC. This is the meeting place for our family which now includes 4 generations. We wish we all lived closer so we could enjoy it more often, but we love to share it with other families. Anna's Cottage is the perfect house for a family, a couple's getaway or friends trip. It has multiple living areas and plenty of space for all. Once you arrive, there is no reason to get back in your car. There is so much within walking distance and if you decide to travel further, there is a free trolley that will take you anywhere on the island. We know you'll love the pool and backyard, but our favorite place is the screened front porch. When you open the sliding doors it opens up into the kitchen/dining/living area. We also love the swing on the covered lanai. 2 blocks to the beautiful Gulf of Mexico. Watch the dolphins, sunbathe or walk the 7 miles of white sugar sand beach. Great coverage throughout the entire property. Great kitchen w/ butcher block island and 2 barstools. Dining area is adjacent and has table that can seat six. Sliders open up onto screened porch. CD player with speakers in television cabinet in rear family room. Located in television cabinet in rear family room. Constantly heated to 80 degrees and has huge paver deck with plenty of space for sunbathing. Right off the main drag, this lovely, roomy cottage was a hit for us. Everything we needed. Nice pool and patio in back, screened in porch in front. We were lucky enough to be there when the night blooming cactus bloomed. Gorgeous bonus. Thank you very much for your wonderful thoughts. Seeing the cactus flowers bloom is so beautiful and rare. We’ve only been lucky enough to see it once in the 10 years we’ve owned Anna’s Cottage. Great location and set up for our family vacation. Found this place last minute after having to cancel our trip and it worked out perfectly. we loved the house. Would recommend. easy walk to beach and to bay. We stayed a week in July and we loved it. The house is a short three block walk to the beach, but the best thing we did was rent a golf cart from Beach Bums for our stay. It’s the easiest way to get around the island. We were close to everything, including our favorite place to eat, The Sandbar. We loved going to the beach and then coming home for a swim in our pool. The house has plenty of room and provided everything we needed. We would stay here again! We are so glad you enjoyed your vacation. We look forward to you coming back again. Spacious home in a great location! We absolutely enjoyed our stay! Check in and check out was a breeze. The house accommodated us with ease. We utilized the grill and pool everyday. The block and a half walk to the beach was a great perk. There were several restaurants within walking distance. We didn't want to leave and would definitely stay here again! Thank you for the wonderful review! We hope you will come back again. Very spacious and clean home! The home was nice and clean. Would stay there again if going to AMI. Anna's cottage was a very comfortable, homey vacation spot for our family to get together and enjoy the beautiful island. We loved the easy access to the beach and local eateries and shops. The outdoor pool was an added bonus! Located one block from the Pine Ave. shopping district. Antique shops, aquarium, outlet mall, art galleries. Rates are subject to change until booking is set.